New Amber SOS Blog for our relaunched website www.ambersos.com is coming soon. 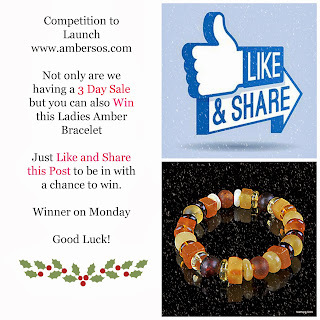 Our online store www.ambersos.com is very much alive and we are posting our Baltic Amber Jewellery worldwide every day. Please see our contact details below. Amber is long renowned as a natural aid to better health. It can ease the pain associated with many Chronic Pain Conditions. To get our new website off to a good start, we are having a 3 Day Sale on all products. Ideal for you to pick up some Christmas Gifts! We don't want anyone to miss out on a bargain so to spread the word of the Sale, we are also running a Competition of our Facebook Page! This unique Geometric Amber Bracelet is up for grabs. So we hope you share, share, share!